Yes, customers will fight for the best products and services. It’s all about psychological ownership! 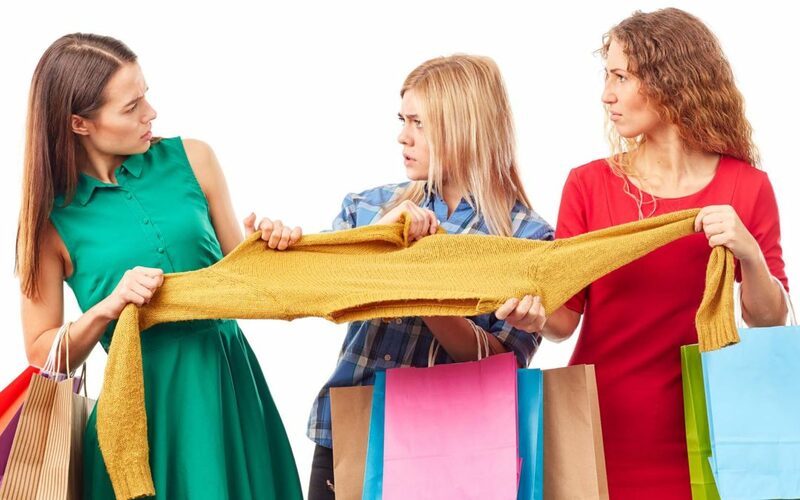 It happens every year on Black Friday… Bargain hunters engage in frenzied fights to get their hands on the best deals. Most of us watch video footage of these brawls in horror, wondering how people can actually tackle and throw punches at each other over retail products. What could possibly cause this madness? Could too much Thanksgiving turkey be to blame? Not quite. The reason is a term you may be unfamiliar with, but have most likely felt at some point in your life. It’s called psychological ownership. Psychological ownership is a strong feeling that something is part of us or belongs to us (even if it doesn’t). You know, like spotting the last cookie in the box and callings dibs on it. Or finding one of the last parking spots at a crowded mall. There’s just no way you’re going to let another driver take that spot away from you. “Mine,” you say to yourself. You saw it first. A few months ago, Weight Watchers changed its official name to WW… and boy oh boy, did customers get angry. The interesting thing: It all had to do with psychological ownership. Weight Watchers – or WW, I should say – did have the best intentions. They simply wanted customers to feel less like they were on diets and more like they were participating in a wellness program. After all, WW knows that in 2018 people are more concerned about eating clean and being healthier than being obsessed with their waistlines. Instead of using a company name that refers to watching weight, they changed their name to be about health, complete with the tagline “Wellness that Works”. So why were customers so furious? Think about it this way. If you’ve had a friend who married and changed their last name, you probably had a hard time remembering to use their new name – especially if you’ve been friends for years. You may have felt frustrated at times, but you learned to adjust because that’s what friends are for. WW, however, isn’t your friend, and you can’t help but feel resentful that you must remember to refer to them by a new name that doesn’t seem to make sense to you. You see, the issue is that WW didn’t understand what their name really meant to customers. They didn’t take psychological ownership into consideration. They failed to realize that we, as humans, don’t usually think about what company names mean in literal terms. When we think of “Weight Watchers”, we think about losing weight. Period. Just like when we think of Amazon we think “huge marketplace or fast shipping”. We don’t consciously think about companies in terms of marketing categories such as innovation, even though the company is always coming up with new and innovative technologies. Brand identity is something that we – as customers – don’t want to spend time thinking about and should be implicit with the products we need. Changes made without considering the end users result in poorly designed interactions. WW’s name change resulted in customers no longer seeing themselves or what they needed within the brand, consequently decreasing WW’s success and the impact of their products with their consumers. As you can see, psychological ownership is an incredibly powerful force. Many successful companies are well aware of this and use it to entice people to make purchases and feel a need for the products they sell. They know that winning products and services don’t only depend on what the customer receives when they make a purchase. Success depends just as much – and in some cases more – on how humans interact with what they buy and how they see the company and their product as part of their individual life story. Take the first iPhone, for example. It functioned similarly to the BlackBerry, but the experience was much more user friendly. From the start, Apple set out to promote an ownership experience with their products. This is what has made them so successful. All you have to do is walk into one of their stores to see this firsthand. Before stores open, it’s said that employees use iPhone apps to adjust all of the laptop screens to the same angle. This encourages customers to touch the laptops and adjust the screens to their own preferences. The ability to make physical contact with a product and customize it makes us feel like it’s ours. In addition, customers are encouraged to stay in Apple stores to test products for as long as they’d like. You’ll never find employees asking them to leave. In fact, you’ll never even find employees correcting the way customers may mispronounce Apple product names. This is completely forbidden, because the experience must be the best one possible for the customer. This all has to do with psychology and the ultimate user experience. While some companies “get it”, most don’t. Understanding psychological ownership and how to use it to your company’s advantage ultimately involves understanding human centered design. Human centered design allows companies to use behavioral science rather than a unproven great idea to create successful products and services. If WW had used human centered design methodologies rather than just thinking a name change was a good idea, the outcome would have been much better. You see, they changed the name based on how they thought customers wanted to view the company, not how customers actually did view the company and its products. Thus, human centered design enables companies to rigorously test ideas to determine which ones truly work. Contrary to what you may think, human centered design is for every company in every industry – no matter how large or small it is. It begins with defining what outcomes you want from the design and what your users need, and also includes creating ways to measure to achieve both objectives. It ends with testing and refining how effective your ideas were and scaling the solutions. Human centered design takes the guesswork out of the process, and because it is user-validated, it creates solutions that have a higher likelihood of success. A company that understands what its customers need and want is a company that designs products and services that customers will always fight for (hopefully not with tackles and punches though)! Let us help you grow your business by creating the very best user experiences! True business success is driven by the people you develop products and services for. It’s driven by the real problems you’re solving. If your company isn’t using human centered design methodologies when designing products or services, there’s a good chance that your products or services will fail. No one wants that. By working with a human factors consulting firm like us, your company will move beyond a typical business setup to become a team that’s focused on user experience as much as individual responsibilities. Contact us today, and we’ll help your business thrive! I think product design is the most important. The explanation is very good.